Wiedemann states he sees himself as a 'camera lens for celebrities' and documents the habitat that surrounds us in the twenty first century much as a 19 Century painter would do, but using spray cans instead of oils. Wiedemann's work is highly influenced by fashion and celebrity, in fact names Prada and Vogue as his main influences alongside Haring and Basquiat of the art world. And it was Karl Lagerfeld who introduced Max to the Editor of French Vogue at a restaurant in Paris, when Karl Lagerfeld bought a painting, hence thrusting Maximillian into the art spotlight. Maximilian is constantly evolving with new materials such as neon, found item sculpture, photography and film but what stays constant is his razor sharp wit and incisive humour - always pointed at the vanities of the rich and beautiful, but only enough to keep them on their toes, for Wiedemann himself inhabits this world that he documents. Maximilian Wiedemann's works document and reflect on 21st Century life, but above all they allow it to laugh at itself, because if we lose that we lose our greatest pleasure - laughter. Material Chemistry is a new work based on todays materialism and Society’s Obsession with status Symbols. 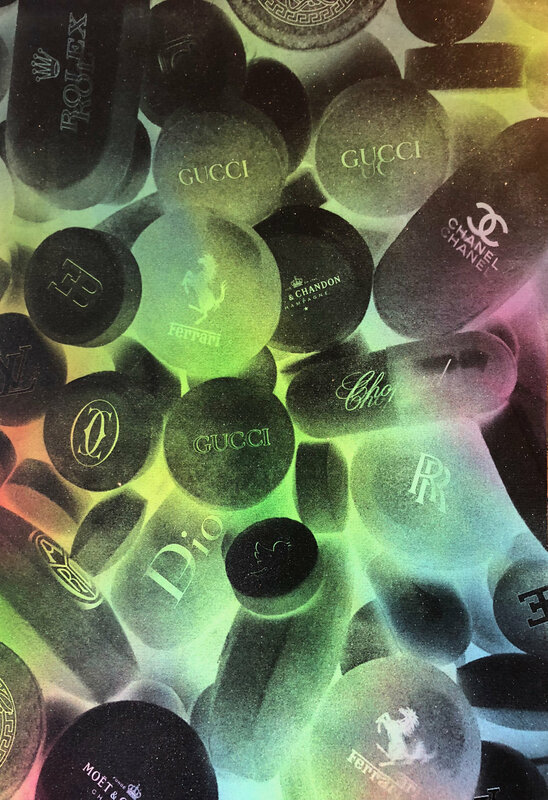 Pills are addictive and so are the luxury brands as they define peoples status in sociey. Based on the Luxury life and debauchery that occurs in Paris, this work plays on the rough reality of life. Not every person in the world can live life of luxury or can afford expensive brands. 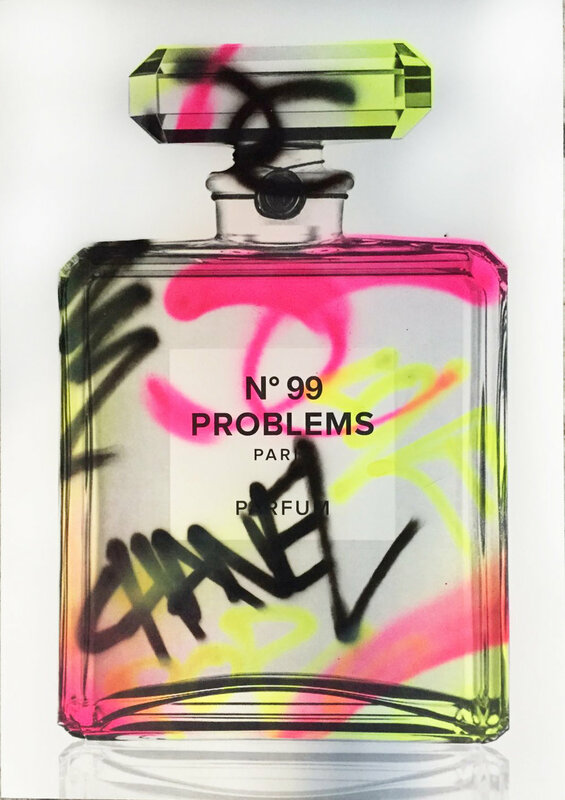 Most of all people have a lot of real problems to deal with there for the paradox of Chanel and 99 Problems with the graffiti background . The only pain is Champaign is one of Wiedemann well catch phrases. 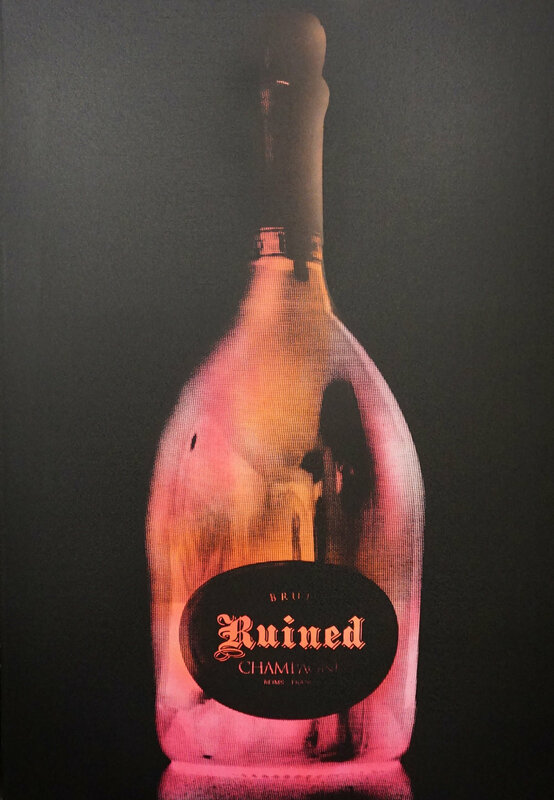 Ruined lends is Ironie of the Champagne lifestyle in western culture , not everyone is as real or truthful as one thinks.